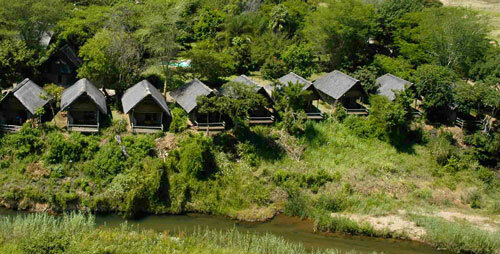 Hippo Hollow is nestled amongst lush indigenous gardens on the banks of the Sabie River in Hazyview, only 15 minutes from the world famous Kruger National Park's Phabeni Gate. 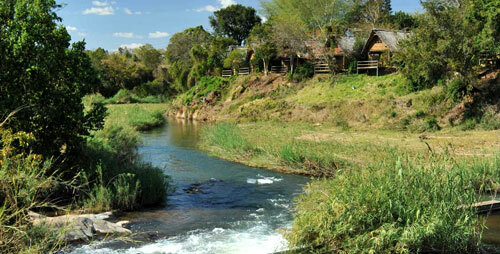 Here one can retreat in comfort to one of 37 thatched semi-self catering chalets, 26 hotel rooms or 28 deluxe rooms, which either overlook the picturesque gardens with its two swimming pools or the mighty Sabie River. Dine in the a la carte restaurant on a variety of mouthwatering dishes and enjoy a selection of South African wines from our cellar, whilst watching hippopotamus graze peacefully on our lawn against the backdrop of a glorious sunset. A variety of activities await you, from open vehicle safaris in the Kruger National Park to helicopter adventures, swooping over mysterious gorges and cascading waterfalls. Immerse yourself in a Feast of Culture with a night of Shangaan song and dance at the Shangaan River Club. Enjoy an exhilarating elephant-back ride and interaction experience; take a leisurely horse ride in the Sanford Conservancy; or simply relax by taking a beautifully prepared picnic to the river. However you choose to spend your time, Hippo Hollow will leave you feeling relaxed and refreshed.